DesignBlog presents a big list of best free fonts, typefaces and typography. 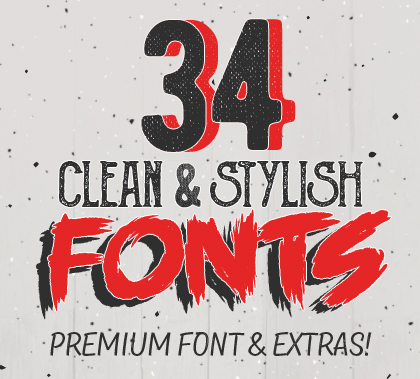 This is the another fonts collection for graphic designers. These fonts and typefaces are specially gathered for your next design. In this list some of the typefaces are best for big typography and poster designing. Custom designed fonts are a great solution for making your company stand out from the competition. We are understand the requirement of market and gathered a unique fonts and typefaces for you. Facilities include the design of a new typeface, modification of existing fonts, addition of accents, logo’s and special glyphs. Typography is one of the most important aspect in modern web designing. We are always trying to share best downloadable high-quality Fonts, which stand in a unique class of their own, and which will serve as a excellent base for any graphic designer project. So today’s we’re happy to share with you a collection of High Quality Free Fonts for commercial use that were carefully chosen by the licence. Yuma is experimental fonts with straight glyph, inspired with typical Navajo textiles who have strong geometric patterns. Nowadays, Navajo pattern is very popular for the production of textiles, these fonts are specifically designed for display type for titles, headlines, and posters. This fonts available in four different style, Latin alphabet and numbers only.